Research England's REF2021 Guidance on Submissions addresses Open Access in paragraphs 105-114 and 223-255. HEFCE (now Research England) issued their initial REF2021 open access policy in March 2014, setting out obligations for institutions to provide open access to research outputs, in order to facilitate impact and re-use. In April 2015, the University of Hull introduced an institutional policy to help researchers comply with REF policy, revised April 2017. Final guidance for the REF2021 policy was published by Research England in January 2019. In order to be eligible for submission to REF2021, all journal articles and conference papers published in a journal must be open access. This obligation came into force for articles accepted 1st April 2016 to date, and cannot be met retrospectively. Articles accepted prior to April 2016 do not need to be open access, but institutions demonstrating engagement with open access throughout the REF period prior to the policy will gain benefit in the Environment score. 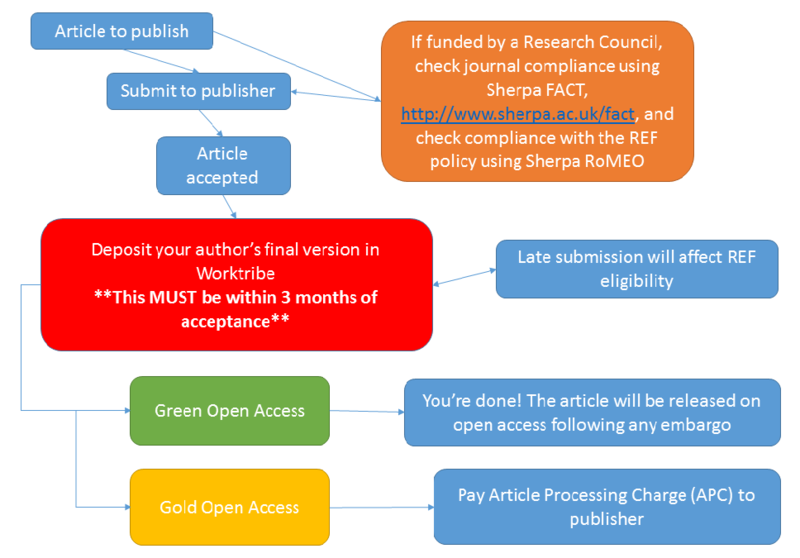 Open access can be achieved through Gold or Green routes. The article must be placed in an institutional or subject repository in either case. Articles must be deposited in a compliant repository (such as Worktribe) within 3 months of the date of acceptance for publication. Research England has agreed a list of exceptions to the policy, where circumstances prevent full compliance, but use of these is expected to be rare. University of Hull is committed to provide mechanisms to enable authors to comply with REF2021 obligations. It is the responsibility of the author to deposit their research output during the timeframe. A Creative Commons Attribution, Non-Commercial, No Derivatives licence (CC-BY-NC-ND) would meet this requirement. This is the most restrictive Creative Commons license. Authors should be mindful that their funder may mandate a more open licence.